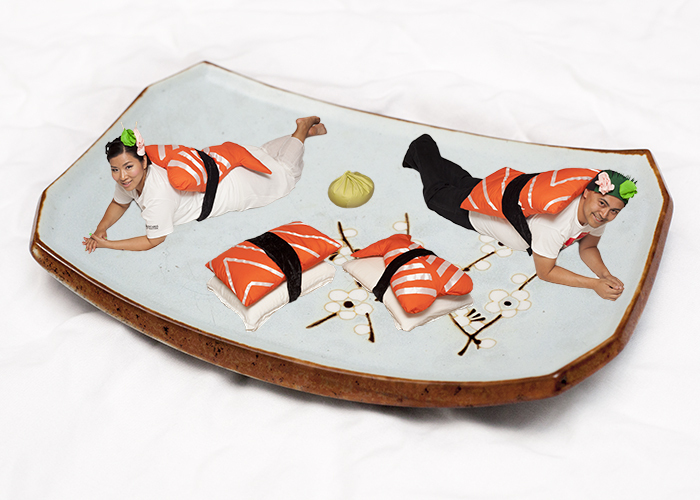 I was looking up couples costumes when I found the idea to dress up as sushi. My immediate reaction was, "I can make that!" About $15 of materials and several nights later, we had our outfits. The bonus is that I can simply wrap them around a couple of regular white pillows and now we have sushi pillows! That's a big plus because this was not a trivial amount of sewing. (Maybe one day I'll get a sewing machine). The following is a hasty Photoshop job. It's good enough for my blog. I was basically following an Instructable I found. I started with a couple of yards of orange fabric I snagged on sale. I cut up a paper shape for the shrimp until I was happy with it. After cutting the shrimp fabric, I laid out the white ribbon that would be the stripes and sewed them into place. I repeated this for the salmon. That one is just a basic rectangle, so I didn't use a template, but I did use the shrimp as a size guideline. Once the stripes were sewed in place, I laid another (mostly) identical piece of orange fabric on top and sewed them together around the edges to form the pillow. Unfortunately, I failed to document the rest of the creation process. Essentially, I created two custom (though far from professional) pillows. All that was really left was to add the stuffing and close them up. To act as the nori that would bind the fish to the rice (the rice being us), I bought some velvety black fabric (to replicate the sheen of nori). For the headpieces, I created some wasabi and ginger using bright green and pink fabric. By this point, I completely forgot to take in-progress photos, so all we have is the finished product. My version of the headpiece, as modeled by Bawoo, has my rendition of the green plastic thingy that they usually include in to-go boxes.